Voici la 4ème vidéo de remerciements ! Voici la 3ème vidéo de remerciement ! Et voici la deuxième vidéo réalisée en promenant mon toutou ! Merci encore à Simon, Baptiste, Cécile et Yanna ! Cette fois-ci, je me suis fais contacter par Valeria Ricci, fondatrice de Light Painting Italia, un blog spécialisé, comme vous vous en doutez, sur le Light Painting ! “If you really want something, do it. Théo Solaesa is a young light painter with a beautiful and ambitious project! 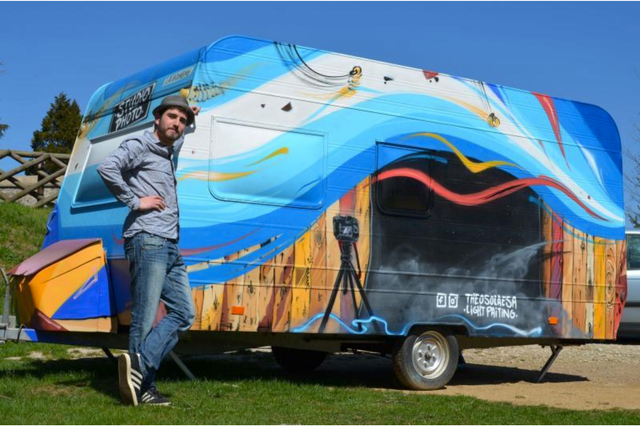 He is the first artist that created a traveling light painting studio on caravan. It’s amazing. 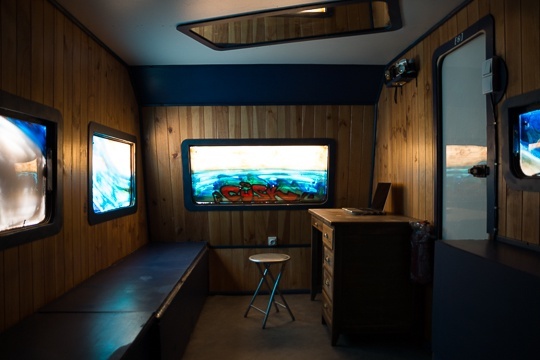 He’ll leave soon with his tour around the Natural Park of Pilat in France, but to be able to pay for the costs he has launched on Ulule a crowdfunding campaign. We of Light Painting Italia contacted him for some questions and get to know him better. The interesting interview came out and we recommend you to read it! 1. How and when have you discovered light painting? I discovered Light painting when I started photography with a friend who sold me my first camera. He told me: “Come on dude! I’ll gonna show you a different way to the photography!” And I fell in love with this kind of photography! 2. How long have you been practicing the art of light painting? I started Light painting at 19. 3. When and where did you get that idea? The idea of my caravan? Before to be a photographer, I was (and I’m still) a musician, with friends, we had a “concert caravan of music” and we went on the road to play music. It was unbelievable! Since that day, I wanted to have my traveling work project! I discovered Light painting and since last year I work to create this project! 4. I read that you will go around the Natural Park of Pilat in France. Do you think that you’ll go to other countries in the future?Yes, I’ll go to the park of Pilat because I live just near it and I am sponsored by my department for making artistic project in the Pilat. Not yet, but why not if anybody wantsme, I come! 5. What’s your ultimate objective? My ultimate objective? It’s easy to understand but not to do: To be happy. When I was young, I was not a good student and the only way what I wanted, professionally I mean, was to be happy in my life. With my projects, I think that it’s not far! 6. How do you see yourself like, 1 or 2 years from now? To be honest, I don’t know. I just beginning this one, I have a lot of projects in my mind and I want to make all of them. 7. We usually ask for a special goodbye for the Light Painting Italia readers, then do you want to say your special goodbye for us? For my goodbye, I would like to tell everyone to pursue their dreams. If you really want something, do it. Life is short and unfortunately sometimes we do not have time to do what we love. Only listen to your instinct but still a little your mind! Thanks a lot for this interview and see you later I hope! Maybe this project will last just a year or 10. I don’t know. I’ll stop when I’ll not have more fun I think. Bon il s'agit d'un exercice assez compliqué pour moi alors soyez indulgents mais la première vidéo de remerciement est réalisée. Je les ferais toujours de la sorte c'est-à-dire : avec mon portable, les prises de vues comme le montage. Comme ça je pourrais vous faire partager mon quotidien héhé.